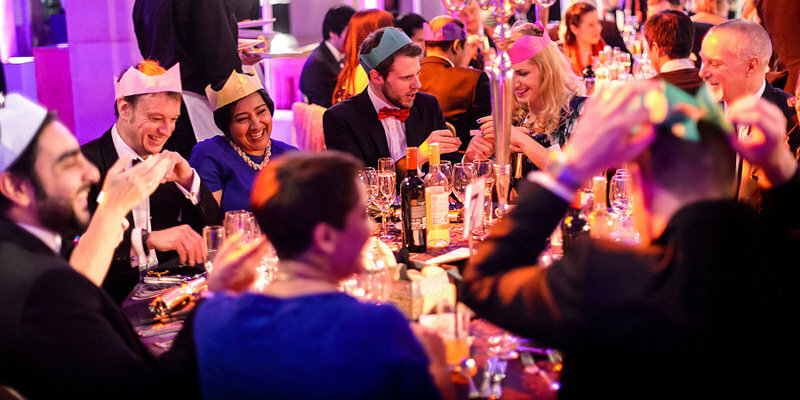 What makes a great office Christmas Party? Right about now people are shaking off the chill of winter, readying for the long days of summer ahead and quietly preparing for the workplace event of the year – the office Christmas party. With only 12 weeks to go until Christmas season kicks in with earnest, now is the time to be selecting venues, scouring menus and chatting around the water cooler about the festivities to be had. With that in mind, we’re exploring the all-important topic of what makes a great Christmas party? Depending on how festive your office likes to get, Christmas parties can generally be broken down into three definite stages…pre-dinner drinks, the main event, and the post dinner party. The ethos of your office (and the corporate budget) will likely determine whether your organisation embraces one or all three of these stages, and will also determine how much guests are required to pitch in for the fun. Pre-dinner drink are a great way to get people in the mood for a night of revelry ahead. They can be held at the same venue as the main dinner or somewhere else entirely, but allow attendees to get changed, shake off the shackles of a day at the office and enjoy a little casual socialising with comrades before getting down to the business of dinner. So which venue, where and how do you inject a little extra flavour into the affair? Pre-dinner drinks set the one for the rest of the evening, and you probably want a venue that’s within general proximity to your place of work and/or the venue for dinner. This allows people to make their way there after a day at the office, and then walk to dinner easily. The style of venue you select will depend on the general tone of your office parties. For some it might be the local pub, for others harbourside drinks, and for others still the boardroom might be the ideal staging site for a couple of bevvies and light finger-food to kick-start the evening. Looking to inject extra flavour? The main event is the chance for staff to wine and dine in suitably relaxed yet ambient surrounds. As the Christmas party is akin to a thank you for a year of hard work, it’s worth selecting somewhere with a wow factor for the occasion. Again, there are probably criteria to fulfil like accessibility to the workplace, proximity to public transport and a menu that is suited to a wide variety of tastes. For the main affair, the venue should be one that suits the professional ethos of the workplace, while encouraging a festive but not party-hard ambience. You’re looking for something that will cater to varying levels of management yet be popular with general office staff as well. Menu is one of the biggest considerations of any staff party, with something required to suit all tastes. The food should be exciting and memorable yet accessible to all, and the best venues will work with you to meet any dietary requirements. Most venues will also have a choice of Christmas party packages to suit the budget and size of each organisation. Meanwhile they’ll work with organisers to further accommodate extras like entertainment or speeches. It depends on the ethos of the workplace whether you will also offer entertainment during an office Christmas dinner. If you are considering some entertainment to add a little atmosphere to the occasion, then subtle is the go. You could also look for a venue with dancefloor, so as the evening progresses, it transforms from dinner into a little dancing as well. Many workplaces choose to host a formal style dinner, and then offer a more relaxed after-party at a separate venue, allowing staff to really let down their hair. By this stage the alcohol may be flowing freely and the inhibitions have diminished, so an after-party allows senior management to attend the main event, but step away when the evening becomes more raucous. A club or venue with dance music near the dinner venue is ideal. The budget is a big factor for any organiser tasked with sorting out the Christmas party event. Most offices will have a set budget per head incorporating food and maybe a limited amount of alcohol. Talk with your intended venue/s about what your budget is, and how many people will likely be attending. Then be clear with your staff about what’s included for the evening. Some offices spring for table wine and beer at dinner, some have a set bar tab, some even allow a plus-one, while others pay for food but not alcohol. At this point also ask your staff to get back to you if they have any serious food allergies, so you can alert the kitchen staff in advance of the function. The size of your organisation and the numbers likely to attend the Christmas party will determine the types of venues available to cater to your event. They may also impact the style of event you host. Smaller office numbers lend themselves to sit-down dinners, while a big corporation might prefer a stand-up cocktail style affair. Speak to potential venues about the numbers involved, and ask about their options for catering. Once you have selected a venue, and sent out invites, be sure to inform the venue of exact numbers prior to the occasion so they can order in the required food and allow for enough staff to cater the event. On the subject of event style, are you considering a formal two or three-course dinner, would you prefer a buffet or will canapes and share plates be a better option? Will people be ordering off the a-la-carte menu or is an alternate drop a better way to go? Work with your venue to determine the best option for your corporate event. You also need to ascertain whether the venue can cater to allergies or dietary restrictions, and if these are likely to be relevant, ensure you inform the venue in advance of the special meals that will be required. It’s worth considering how staff will get to and from the Christmas party venue or venues. If the restaurant is in proximity to the workplace, they can probably walk there after the work week ends. But if it’s further afield, you may wish to provide transportation by hiring a bus or mini-buses. Once the night is over, how will staff then get safely home? Proximity to good public transport could be a plus. It also helps ensure people do not take the risk of having a couple of beverages and then driving. Whether it’s a hamper, a bottle of wine, or a small corporate token of appreciation, will you provide a Christmas gift at the annual Christmas party, or will you incorporate gift-giving between staff in some way? If gift-giving between staff is part of your corporate culture, assist staff by letting them know what’s expected and the budget involved. Don’t forget to alert staff to the dress code for the evening. It might be corporate wear, straight from the office, it might be semi-formal if it’s a really special event, or it might be more casual if activities are planned as part of the evening. Providing a dress code helps staff feel more comfortable and also helps prepare them for what’s involved in the event. Occasionally a Christmas party is remembered for all the wrong reasons, so it could be prudent to outline general expectations for the big night ahead. The past year has seen issues like staff fraternising and harassment make the news, so if there are rules that apply to your workplace, politely inform staff that they remain in place at any corporate event. Be extremely clear if your staff are expected to contribute financially to the festivities, and outline exactly how this will occur. You might collect money in advance, staff might be required to pay for their own drinks on the night – however you plan to approach it, ensure those attending are aware. Venues across Sydney are extremely busy with Christmas parties throughout the festive season, so you want to consider and lock in dates well in advance. Friday evenings in December are the most popular times for Christmas parties, but you could also consider alternative options, like a Christmas lunch or dinner on a Saturday. Centrally located on the King Street Wharf at Darling Harbour near the Sydney CBD, George’s Mediterranean Bar and Grill has catered to thousands of Christmas parties over our lengthy history. We have a range of options available including packages and pre-dinner drinks and canapes, and also have facilities for entertainment and dancing. You can learn more about or function options here, or speak directly with our friendly staff for further advice.